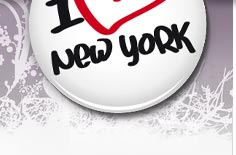 New York webcams - look at New York live through the lens. In New York there are several web cameras located at many different places. See how it is in New York right now - LIVE. Below we present som cameras in town. Note! earthcam.com can sometimes be overloaded due to many visitors at the same time. The camera is places in the harbour of New York. View the Statue of Liberty in different weath and from different distances in light and dark. Boats are passing by. 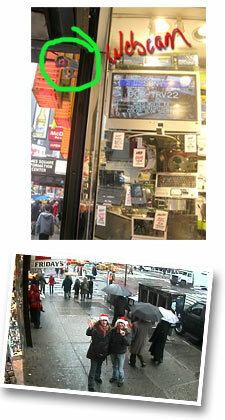 The camera is places outside 47th Digital store at Times Square Visitor Center, showing people that are passing by at the sidewalk. Here you will get a marvelous view of Manhattan and it´s skyline. Here you can follow the building of the new Freedom Tower at World Trade Center area. The camera is placed at the 10 floor in the UN building and is looking down at the area below. The camera is viewing the rink at Rockefeller Center and the golden statue "Prometheus". How does it look at one of the most famous shopping street in New York, 5th Avenue. This is where the ship USS Intrepid had it´s place, but is now moved for renovation. The pier will be re-built and await the return of the USS Intrepid. Why not decide a meeting with the people at home at one of the web cameras in town. When we were in New York (dec-2006) we got this proposal from a friend, to decide a certain time at one of the web cameras. We decided us for the camera at Times Square - the one at 46th street (above). We said to be there at Dec 13 (in Sweden the day for Lucia) at 11AM. We were at Times Square around quarter to 11 and walked up Broadway. In the intersection Broadway and 7th Avenue we saw the restaurant, T.G.I Friday´s and just beside is the store that sell electronics and outside that store in one of their corners you will see the camera. We got there in time at exact 11AM and then we sent an sms to our friends at home in Gothenburg and quickly got an answer back - "We see you!" It was Christmas time and for that reason we had bought ourselves red Christmas hats, we got some funny looks from people walking by, when we stood there waving up in the air with our hats on. We really got funny pictures. When we stood there a couple who walked by stopped to see what we were doing, and not long after that they also stood waving to the camera and talked in their mobilephone. They probably also got hold of their friends at home. So, why not decide a meeting over the internet next time you are in New York.